Growing season is creeping nearer, or even here, and we all are looking at our garden beds from last year. And possibly being disappointed by their condition. Have you considered using raised garden beds this year? Raised beds are great for veggies and herbs, and can be the perfect solution for flower beds when the soil is poor. Or for when a gardener just needs an easier way to maintain their garden space. Easy to put together, DIY raised garden beds are nothing more than a box, with or without a bottom, filled with good garden soil. Plants that are grown in raised planter boxes are healthier, weeds are easier to control, and watering and fertilizing is concentrated right where you need it. Gardeners that have trouble bending over will find raised beds easier to work in, and you can make them any height that works for you. 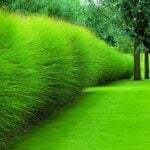 Plus, they just keep the garden neat! If you want to try to grow an above ground garden this year, check out these tutorials for DIY raised garden beds. From ‘HGTV‘, learn how to build a raised bed with the basics. 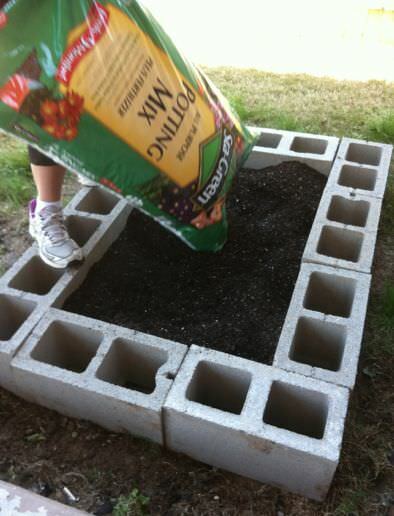 Use this for a raised flower bed, vegetable bed or even for herbs. This is a cheap raised bed idea that is easy enough for beginner DIY’ers to make. The tutorial has lots of photos and instructions. 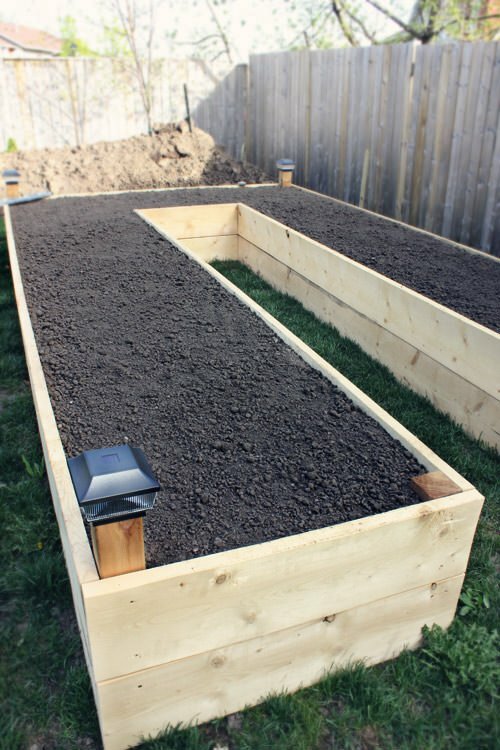 This DIY raised garden bed from ‘DIY Pete‘ looks nice enough to have right up near the house. You don’t have to keep this one out in the veggie garden! Made from redwood, it will withstand the elements. This raised planter box is filled with flowers, but I can see just about anything growing happily here. 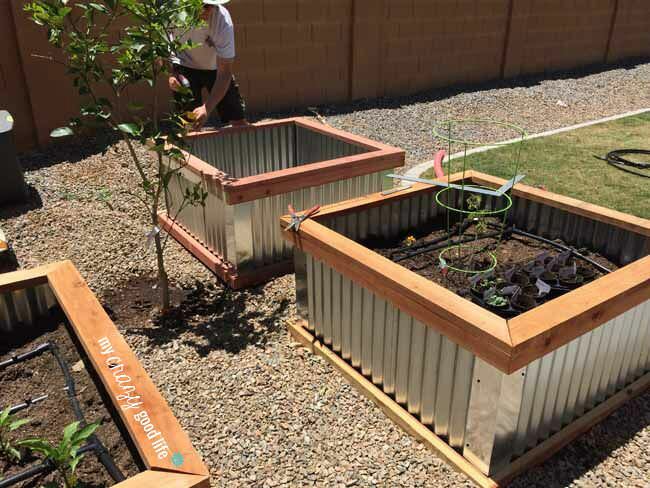 From Becca at ‘My Crazy Good Life‘, these DIY raised garden beds are made from corrugated metal. 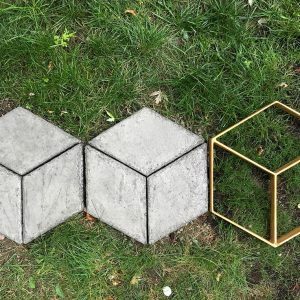 They look a little bit industrial, a little bit farmhouse, and a lot like a good garden idea. 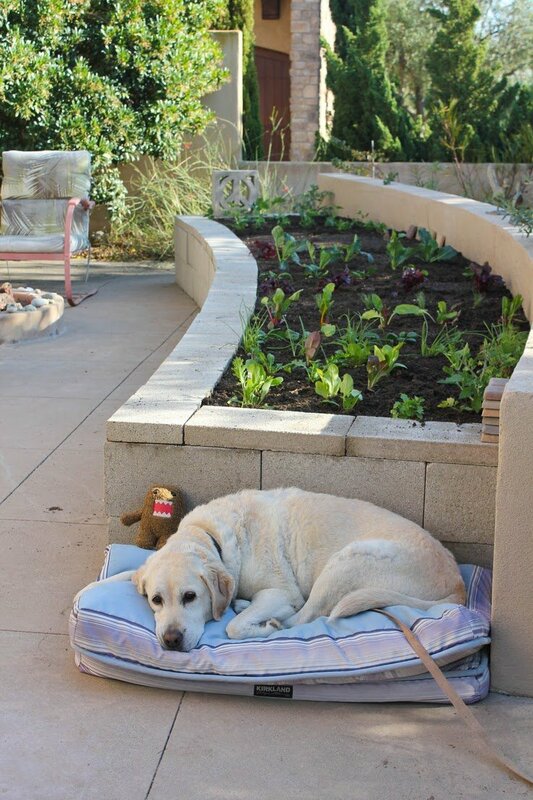 She has lots of step by step photos as she shares how to make this raised bed. Our next project is from ‘Gardenista‘. 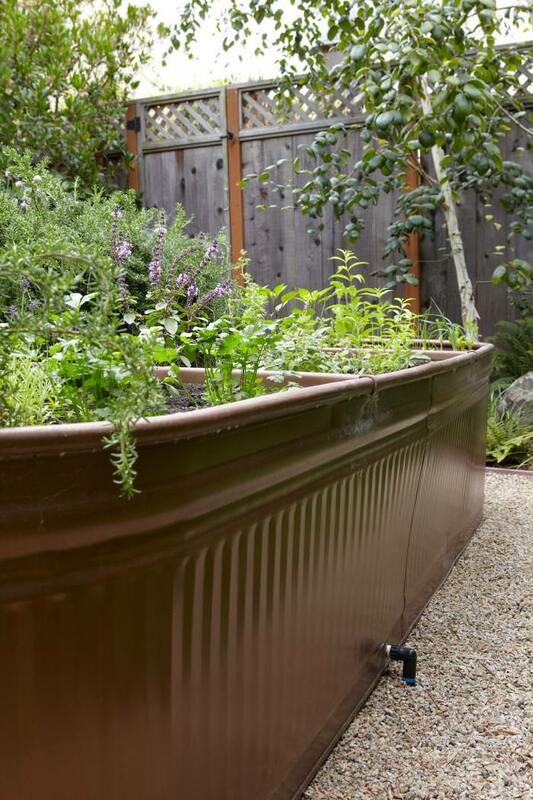 They show us a homeowner with a brilliant idea – using water troughs as DIY raised beds! I love this because it looks like art in the garden, yet tall enough to make working the beds easy for an older gardener, or someone like me who has trouble with her knees. Love this! Photography by Marla Aufmuth. 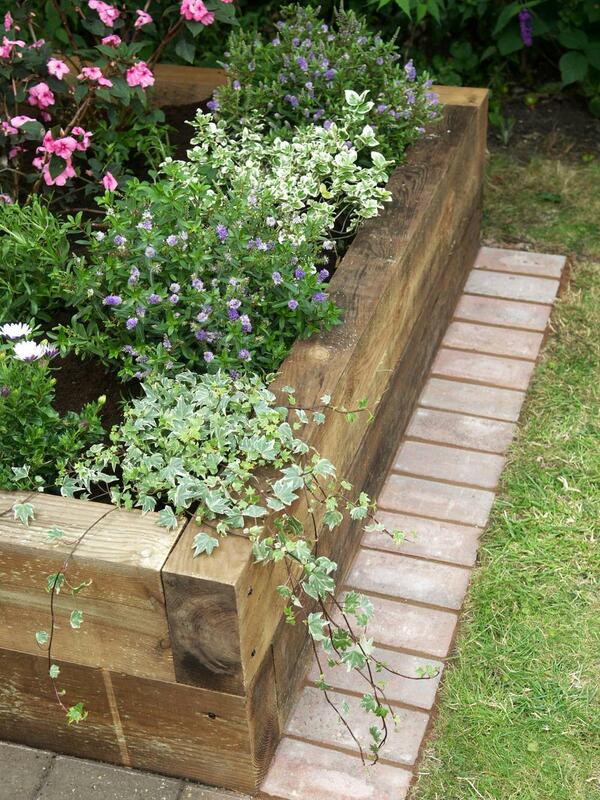 From ‘DIY Network‘, this raised garden bed is made from sleeper timbers. 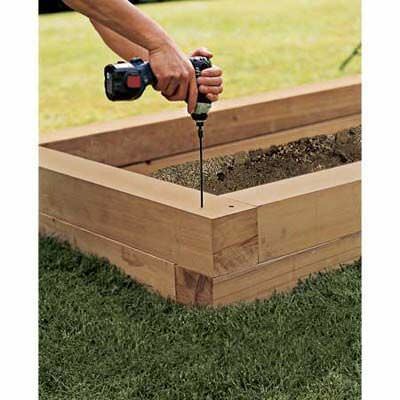 The only power tool you need for this planter project is a drill. 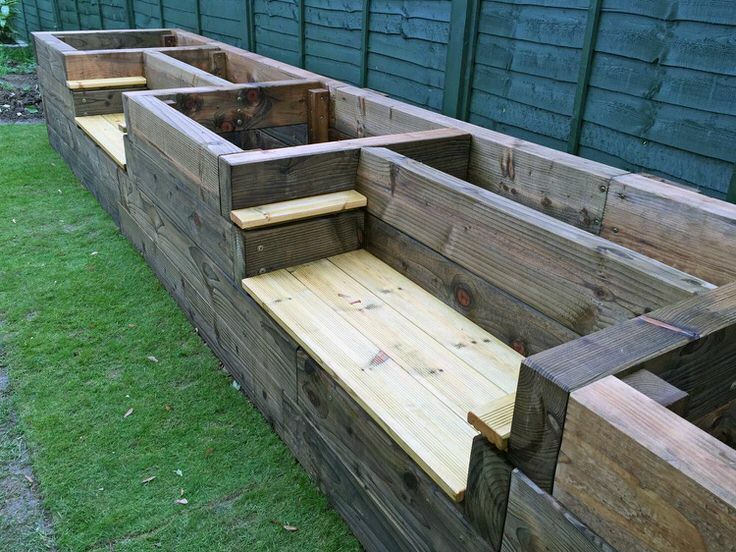 This is another version of a raised planter box using sleeper timbers. This tutorial is mostly a photo tutorial, but it does have a supply list and a project sketch. It also includes step by step photos. From ‘Railway Sleepers‘. Remember, if you use sleeper timbers for a gardening project, make sure they are chemical free. Just need a basic raised bed tutorial? ‘This Old House‘ shows you how to make a raised garden bed from cheap lumber. Step by step, with a supply list. You can use that last basic tutorial in order to make this next raised garden bed from ‘Art & Appetite‘. 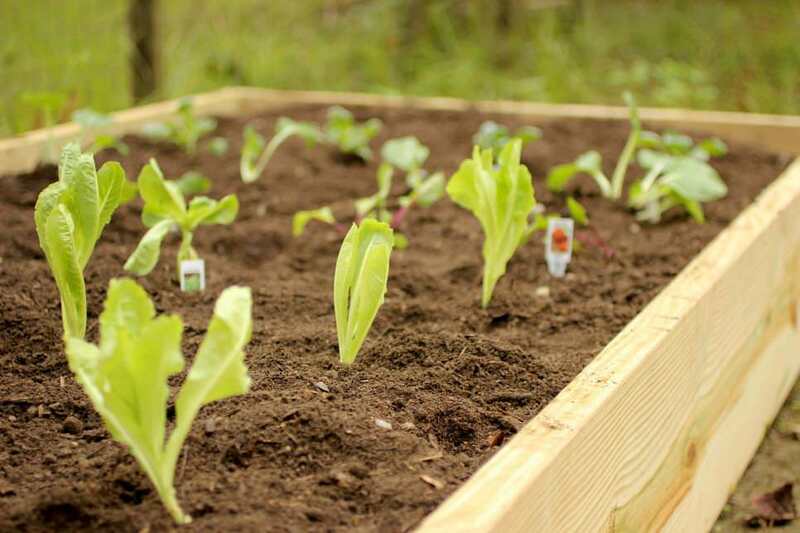 These are simple projects that make perfect raised vegetable beds. In addition, making a smaller size will create a planter box that is easy to maintain. Lots of great ideas on this site on how to use, and also what to grow in raised beds. 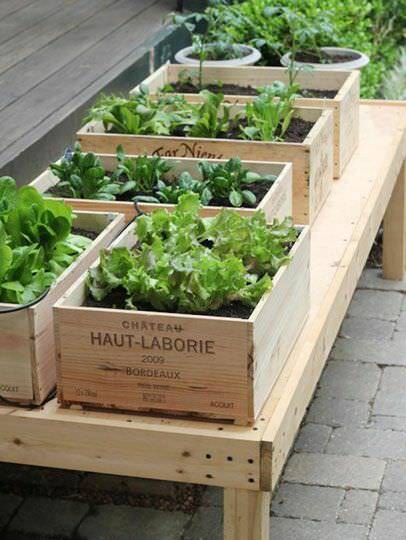 From ‘Brittany Stager‘, this DIY raised garden bed was designed to grow enough food for their whole household! We love the way it has a walkway through the middle to give you good gardening access. 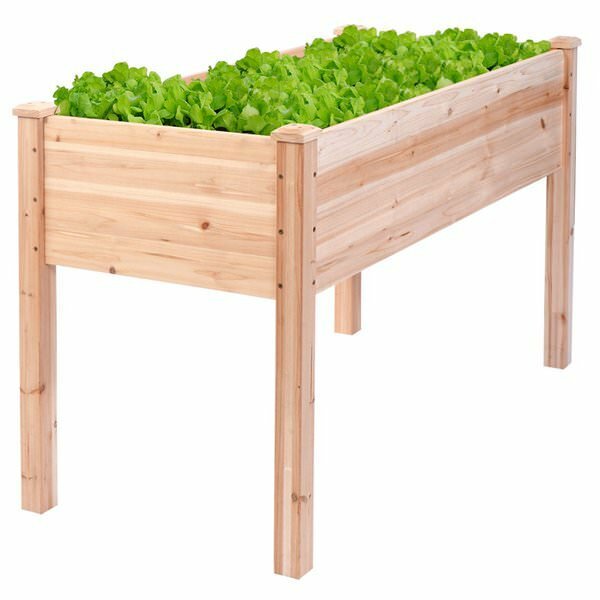 This is the perfect vegetable planter box to make your own “farm to table” garden! ‘Project Alicia‘ created this unique raised bed planter from tin roofing and some lumber. 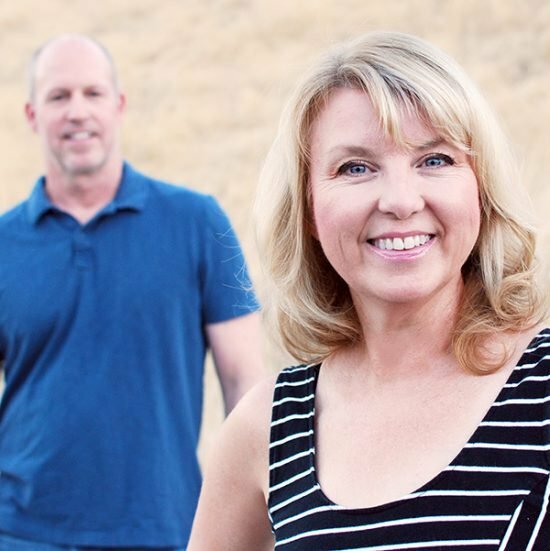 They give complete directions on how they made it, and since their son helped, it was a family project! ‘I Save A 2 Z‘ created these cheap raised garden beds from cinder blocks. I like how they lined the bottom with cardboard to prevent weeds from growing up into the bed. Great gardening tip! 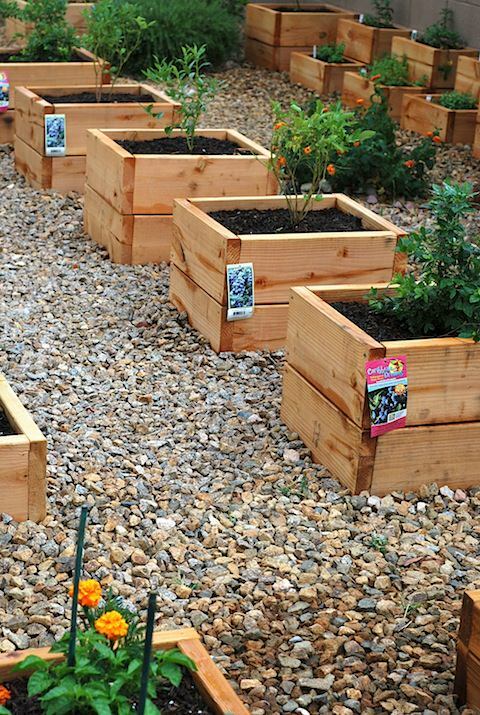 Here’s how to create a wine box raised garden bed. ‘Life on the Balcony‘ created this project that is a cross between a raised bed and a garden container… but it serves the raised bed purpose, and you have to love the vintage charm it gives the garden. 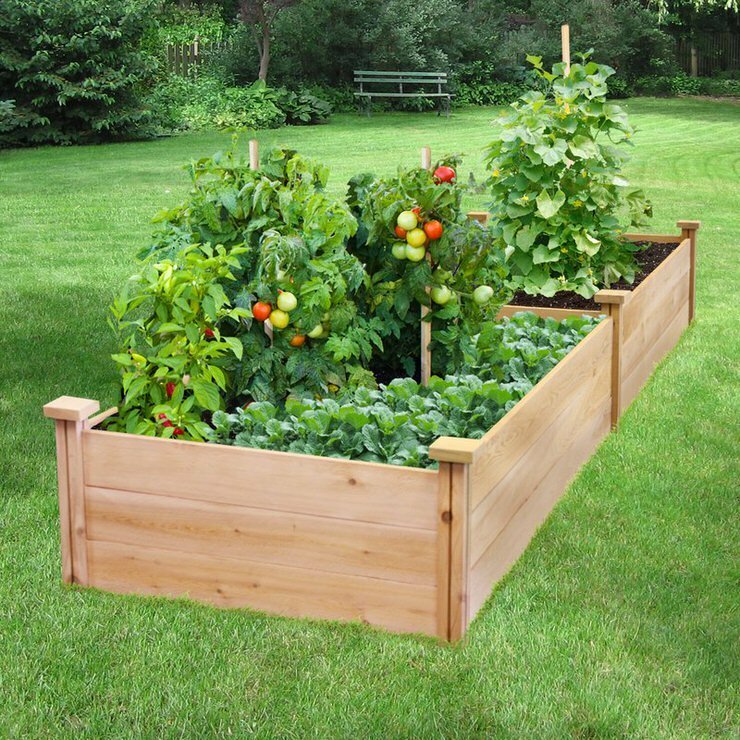 If you aren’t ready to break out the power tools, then you may want to check out these raised gardens beds at Wayfair. We’ve heard good things about the “Blackwell Raised Garden“. It’s cedar, so it will last. We especially like that it’s deep, so it will allow good and healthy root growth. And it’s so pretty, no matter what you grow in it, you can show it off. 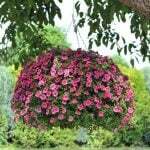 The 2×8 foot size allows you plenty of room for whatever you want to grow. And it’s an easy to assemble kit. And, it’s free shipping! If you need a raised garden bed that is more accessible because of knee problems, back pain, arthritis, (or just don’t want to kneel down in the dirt), we hear ya. (Especially Kathy. 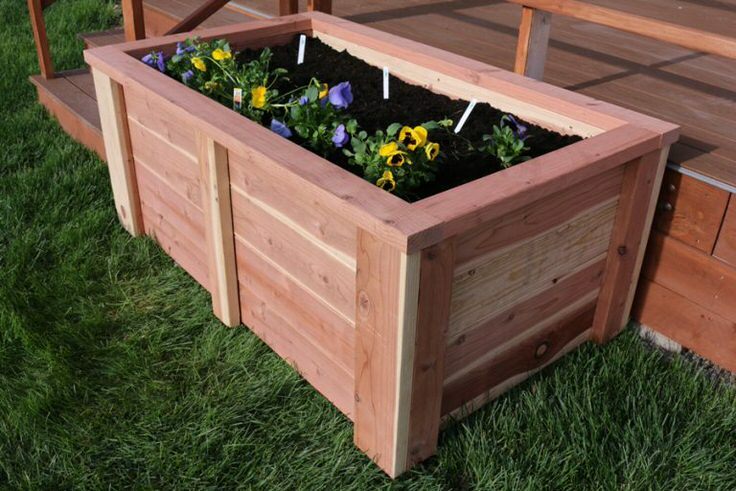 ;)) The “Timothy Planter” is a great choice for a raised planter box on legs, because it is made of solid cedar. These would be great for an herb garden right outside the kitchen door, too. 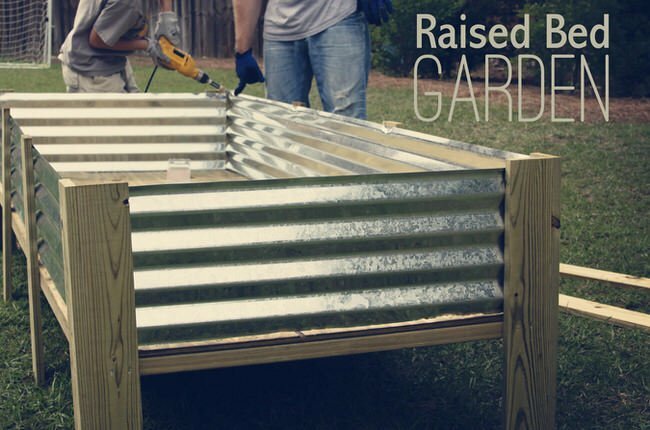 You could create a basic, ordinary garden bed… or you could make one of these unique DIY raised garden beds like the ones shown here! Think of how much healthier you could eat, for less! (Oh, and EASIER!) We think you will also love our posts on How to Build a Garden Trellis and DIY Garden Paths & Walkway Ideas! Quick Tip: How to Grow a Pineapple Plant! I placed 2×4″ garden fence over the garden soil to keep out kitties. Bulbs, etc will find their way up, and you can cover your seeds with soil as the fence underneath deters digging. I’ve tried repellents, coyote urine but they have to be reapplied frequently. We use either long bamboo skewers or wooden chopsticks in our garden beds to impede kittehs’ intended behaviors. Place them about 6-8 inches apart either in a symmetrical grid or a random scattering. 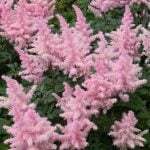 They’re organic, in keeping with the beds’ appearance, easy and cheap to replace every season, and do not inhibit plant growth. Takes me about 10 minutes to “poink up” our two 4×8 raised beds every spring, and No More Kitteh Souvenirs, lest they want a sharp poke in their bums. How do you keep the cats out of your garden ? I really need some help on this. Thanks for any information. you can give me. Thats a tough one Mary, outside getting a dog! Laying down rock as a mulch can help, and some people have had luck with using coyote urine products you can find at your local home improvement store. Anyone have a good home remedy for cat invasion? I’ve heard shredded cedar mulch also works well. I’ve seen people bury plastic forks close together in the soil with the tines sticking up. Not very attractive, but effective! Some cats really don’t like coffegrounds, as it sticks on their paws and tastes awefull. After making coffe don’t trow away the used grounds, but spread them in those places cats like. Also, if you know the cats owner, it’s a good idea to talk to them. A lot of owners are not aware their cat is causing trouble and may even help with finding solutions. Sometimes it’s as simple as keeping the cat indoors for certain hours of the day/night. Also you can talk about sharing costs for keeping their cat out of your garden (as buying new products can get expensive). Motion sensor sprinkler. I love to watch them jump! And it works on all critters. There are several things that keep cats away from a garden. There are pellets which are widely available, some I have seen are called Scoot. There is an ultrasonic appliance that omits a sound that cats hate and there is of course Lion poo which apparently works brilliantly. Good luck! 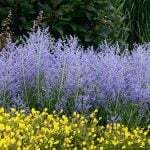 Just plant a few plants of catmint. The cats will be so focused on it that the rest of the yard doesn’t really appeal to them. We have the uglest planter boxes. 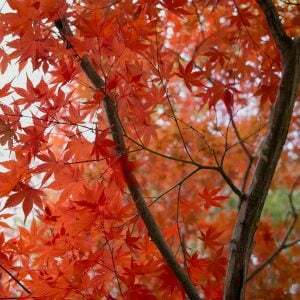 I’m totally going to do one of these ideas in the spring! Thanks for sharing! !